John Lennon said some pretty smart things. Like, “All you need is love,” and “give peace a chance”. And while John died 38 years ago in a tragedy that involved neither love nor peace, I still have to believe he was right. If you read the headlines in any form of communication these days, from Twitter to daily newspapers, you will quickly find yourself sinking into what John Bunyan, in The Pilgrim’s Progress, called “the slough of despond”. And I wouldn’t blame you. But there are other things going on in the world, and there is, believe it or not, reason for hope. 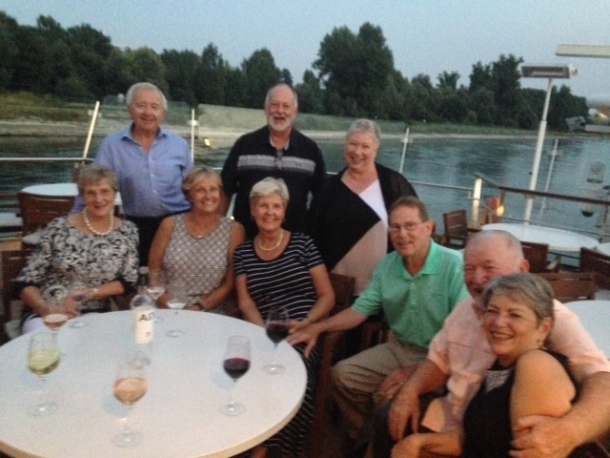 Earlier this summer, we had the opportunity to sail down the Rhine River on the Viking river ship, the Alruna. I know, this travel writing gig is entirely unfair. But I ain’t gonna say “no” when they ask. I digress. As is not uncommon on a river cruise, we connected with a group of instant companions. This group included about ten people – two from the United Kingdom, we two from Canada, and the rest, Americans, from sundry states. Surprisingly – or perhaps simply wisely – we didn’t discuss politics very much. We shared stories of our lives (it’s a wonderful thing to be surrounded by people who don’t already know your stories, and we all took full advantage). We talked about our communities, our families, our jobs (or former jobs for those who have retired). We learned the challenges people face – among us there was a couple raising four grandchildren, and a woman whose husband has been confined to a wheelchair. Serious stuff, yet all of those people, with the rest of us, spent a lot of our time together laughing. Our experience was not confined to our group of ten; we met others who we shared dinner with, or talked to on deck or while we were doing one of the day tours. We also spent a lot of time asking questions of and listening to members of the crew – people who were far from home, brilliant at their jobs, but eager to talk about their own lives, too. We got to know dining room staff from the Philippines and Romania; the hotel manager, a charming and amazingly talented woman from Germany; and many others. We also learned something about our guides in communities in the Netherlands, Germany, France and Switzerland. We tried to reach beyond the historic and cultural tours, to get some sense of their day-to-day lives. Sometimes, we succeeded. So we came home to Canada quite filled with hope. And with faith that people all over world are just… well, people. Many of them, pretty great people. So when I read about the insanity of international politics, I have a new sanity protocol – I think about Barb, and Bob, and Brenda, and Arlan, and Evelyn, and Judy, and Lutz, and Frances, and Alan, and Dan and the other Nancy, and many more – and I feel hopeful.